Balboa Park is a City of San Diego run park, meaning that the arts, culture, and science organizations are lessees. As tenants, some improvements are taken care of by the City, and some, the organization is responsible for. Since sustainability projects most often involve making changes to either operations or the building envelope, the City is an instrumental partner to work with when organizations are completing their wish list of sustainability improvements. Sustainability involves using fewer resources equating to less money spent in the long-term by Park organizations when these projects are completed, and the City understands how important these projects are for the longevity of Balboa Park. The Museum of Photographic Arts (MOPA) located in the historic Casa de Balboa building, rebuilt in 1982, sits in the cultural center of Balboa Park. The museum aims to inspire, educate and engage through the presentation and preservation of photography, film and video. In order to fulfill their mission, they need to have an environment that will continually protect their collections of almost 9,000 photographs and over 21,000 books and items related to photography. Unofficial industry standard care of collections dictates that rooms should be at 70°Fahrenheit and at 50% humidity. 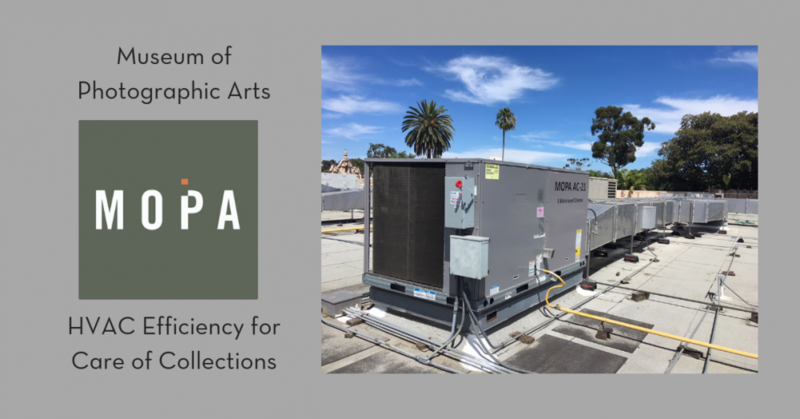 In order to have more control over the care of their collections, in the year 2000, MOPA decided to own their twenty-three rooftop heating, ventilation, and air conditioning (HVAC) units. This is a unique model as most units in the Park are owned and maintained by the City. After running the HVAC units for almost 18 years, they made the informed decision last year to look into replacing their aging units, but instead of just doing the bare minimum, they chose highly efficient units that would use less energy but do the same amount of work. MOPA recognized that sustainability is a choice, but it was the right choice because of many measurable benefits that were desirable for the organization. Not only does using less energy mean spending less money on energy bills, but also in San Diego Gas & Electrics’s service area, where an impressive 45% of the energy used is renewable, using less energy means emitting fewer greenhouse gasses into our atmosphere – creating a healthier planet. Not only did MOPA choose more expensive units because they were more efficient, they also looked into units that were manufactured in the United States to mitigate the impact of long-distance shipping, further reducing their carbon footprint. Another important element to this project is the notion that they aren’t stopping here, they have committed to replacing the remaining 50% of units this winter. Sustainability is an ongoing commitment that MOPA is making. Increasing equipment efficiency is important to building operation efficiency and serves as a model of a non-profit organization taking a necessary leadership role. This project helps solve the critical issue of care of collections that helps MOPA continue to carry out its mission on a daily basis and present special world-renown sustainability exhibitions like Prix Pictet, which highlights important social and environmental issues through the use of photography.